• Stocks End Slightly Negative. U.S. stocks finished the week slightly negative, as optimism over generally solid earnings was overshadowed by signs of economic cooling. All three major U.S. equity indices declined fractionally, representing their first weekly loss since April 6. • Tepid Declines. For the week, the S&P 500 ended virtually unchanged (-0.003), the Dow Industrials fell -0.62% and the MSCI EAFE (developed international) declined -0.25%. • Defensive Sectors Lead. Utilities (+2.81%) and Real Estate (+2.56%) led gainers last week, while Industrials (-3.14%) and Materials (-2.13%) fell the most. • GDP Growth Slows. An early estimate of first quarter GDP topped projections, but slipped from the prior quarter, while employment costs rose the most since 2008. The Chicago Fed’s March national manufacturing activity index slowed more than expected, with just 44 of its 85 monthly indicators making positive contributions. Housing data remains robust, as February metro-area home prices rose at the fastest pace since mid-2014, and March new home sales accelerated to a four-month high. • Benchmark Yields Edge Lower. The yield on benchmark 10-year Treasury notes rose above 3% for the first time since January 2014, but were unable to hold the level on Thursday and Friday. The U.S. Dollar Index advanced 1.36%, while the yield on benchmark Treasury notes slipped 3 basis points to end the week at 2.958%. U.S. GDP growth slowed in the first quarter to an annualized rate of 2.3% from 2.9% in the fourth quarter of 2017. Despite the quarter-over-quarter slowdown, this first of three GDP estimates was slightly ahead of analysts’ consensus projections of 2.0% growth. The weaker economic performance was largely driven by slowing consumer spending, which represents nearly 70% of the U.S. economy and in Q1 grew at its slowest pace since 2013. Despite the near-term weakness, the year-over-year (YoY) change in GDP growth increased to 2.9% in Q1 from 2.6% the previous quarter. Overall, it was the seventh consecutive quarter of accelerating GDP growth on a YoY basis. We anticipate that economic growth will pick up in the second quarter. There are several positives for the U.S. economy including a strong labor market and high consumer and business confidence. Additionally, because of the lag effect following the implementation of the tax reduction for both individuals and corporations in the first quarter, the impact of the tax cuts will likely be felt starting in the second quarter. We also believe it is unlikely the slowdown in GDP growth will impact the Federal Reserve’s decision to raise interest rates at the FOMC meeting in June. The Fed is still likely to raise interest rates by 0.25% because inflation is accelerating at a moderate pace and the labor market is nearing full employment. 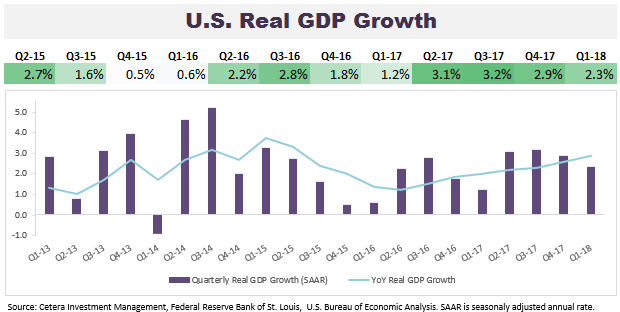 Moreover, GDP growth has been disappointing in the first quarter throughout this economic expansion, and the Fed will most likely be unfazed by this seasonal weakness.